Stalks are about 8 inches long. the color of the stalks varies from brown, to greenish to straw-colored. Most of them get lighter and less green with time. Jane's personal set of 35-year-old stalks, from north-central Washington State, are thin ones ones. Well cared for, even these thin stalks last many years! 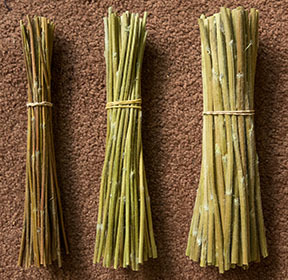 Examples of the pouches and woven ties for the bundle of yarrow stalks. 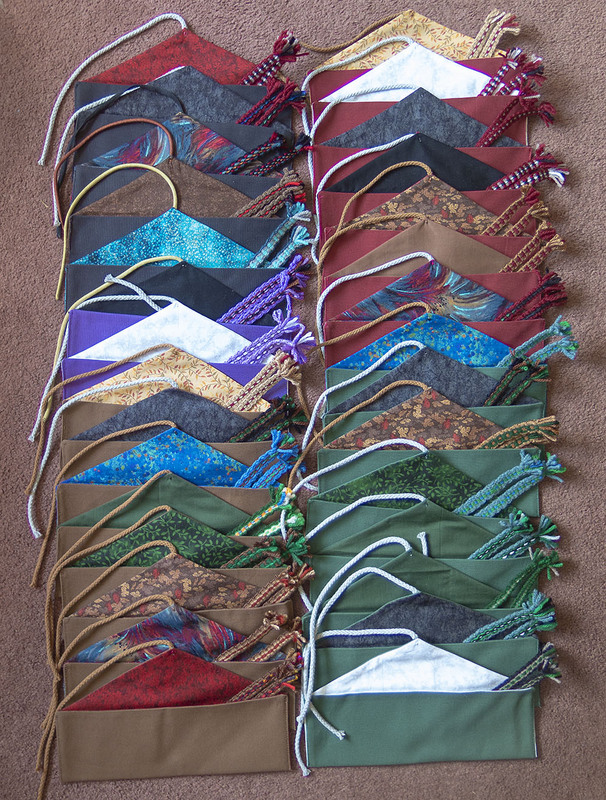 The exact pouches and ties shown here may not be available when you order, and there are more lining colors not shown here. The pouch colors available include: navy, black, forest green, emerald green, plum, burgundy, aqua, red, yellow, oatmeal(white), tan, purple and brown. 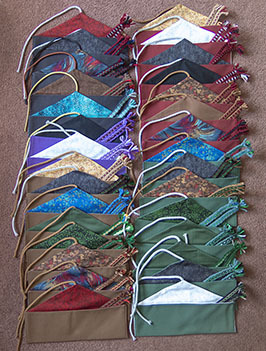 The bottom four pouches in the photo are ones I have not yet sewn and for which I have not yet woven ties -- but I'll do both soon. The color preferences you give will guide me in choosing for you. The side opening makes it easy to get the stalks into the pouch -- with end-opening pouches the stalks get caught up in the side of the pouch as you slide them in. The material is medium-weight cotton canvas The pouch linings are lighter-weight fabric. The ties are woven on an inkle loom; five ties about 13 inches long come from each warping (winding of the long yarn) of the loom.